more than 110 km (60 nmi) stand-off. 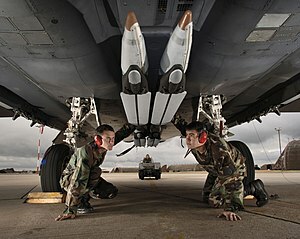 The GBU-39 Small Diameter Bomb (SDB) is a 110-kilogram (250 lb) precision-guided glide bomb that is intended to provide aircraft with the ability to carry a higher number of bombs. Most US Air Force aircraft will be able to carry (using the BRU-61/A rack) a pack of four SDBs in place of a single 907 kilograms (2,000 lb) bomb. The Small Diameter Bomb II (SDB-II) / GBU-53/B scheduled to enter production in January 2014 will add a tri-mode seeker (radar, infrared, and semiactive laser) to the INS and GPS guidance of the original SDB. In 2002, while Boeing and Lockheed Martin were competing to develop the Small Diameter Bomb, Darleen A. Druyun—at that time Principal Deputy Assistant Secretary of the Air Force for Acquisition and Management—deleted the requirement for moving target engagement, which favored Boeing. She was later convicted of violating a conflict of interest statute. Two variants are being developed. One version of the SDB is equipped with a GPS-aided inertial navigation system to attack fixed/stationary targets such as fuel depots, bunkers etc. The second variant (Boeing's GBU-40 or Raytheon's GBU-53 (SDB II)) will include a thermal seeker and radar with automatic target recognition features for striking mobile targets such as tanks, vehicles, and mobile command posts. The GBU-39 has a circular error probable (CEP) of 5–8 meters, which means it has a 50% probability of hitting its intended target within that distance. CEP is reduced by updating differential GPS offsets prior to weapon release. These offsets are calculated using an SDB Accuracy Support Infrastructure, consisting of three or more GPS receivers at fixed locations transmitting calculated location to a correlation station at the theatre Air Operations Center. The corrections are then transmitted by Link 16 to SDB-equipped aircraft. The small size of the bomb allows a single strike aircraft to carry more of the munitions than is possible utilizing currently available bomb units. The SDB carries approximately 17 kilograms (38 lb) of AFX-757 high explosive. It also has integrated "DiamondBack" type wings which deploy after release, increasing the glide time and therefore the maximum range. Its size and accuracy allow for an effective munition with less collateral damage. On May 1, 2009, Raytheon announced that it had completed its first test flight of the GBU-53/B Small Diameter Bomb II, which has a data link and a tri-mode seeker built with technology developed for the Precision Attack Missile. And on August 10, 2010 the U.S. Air Force awarded a $450 million contract for engineering and development. The SDB is currently integrated on the F-15E Strike Eagle and on the Panavia Tornado. Future integration is planned for the F-16 Fighting Falcon, F-22 Raptor, F-35 Lightning II, A-10 Thunderbolt II, B-1 Lancer, B-2 Spirit, and the B-52 Stratofortress. Other aircraft, including UCAVs, may also receive the necessary upgrades. GBU-39 began separation tests on the F-22 in early September 2007 after more than a year of sometimes difficult work to integrate the weapon in the weapons bay and carry out airborne captive carry tests. Boeing is modifying the Small Diameter Bomb with a rocket motor to be launched from ground-based missile systems such as the M270 MLRS. With the Army demilitarizing cluster munitions from M26 rockets, the company says a special adapter case could reuse the rocket to launch the SDB. After the motor launches it to a high enough altitude and speed, the wings will deploy and glide the bomb to its target. The company believes it can fill a gap for long-range precision fires while using its smaller warhead to save larger rocket munitions for strategic targets. While typical MLRS systems follow a ballistic trajectory, the rocket-launched SDB can be launched to an altitude and glide on a selected trajectory. Boeing is planning on a demonstration in 2014. In June 2013, the Air Force announced it would award Boeing a contract to develop and test a laser guided version of the SDB. Called the Laser Small Diameter Bomb (LSDB), it is based on JDAM technology and can hit moving and maritime targets. 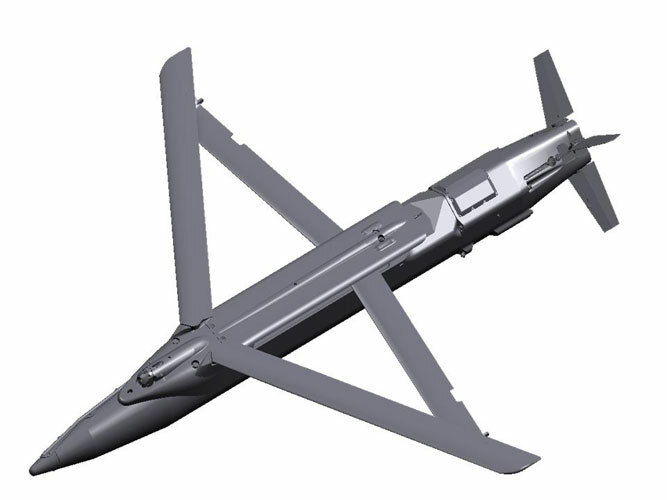 Boeing says the LSDB can be built at a lower cost than the planned Raytheon GBU-53/B SDB II, as it will use the same semi-active laser sensor as the JDAM. However, Boeing admits that it does not have the capability to engage targets in zero-visibility weather, as it lacks the SDB II's millimeter wave radar. Fuze: Electronic safe and fire (ESAF) cockpit selectable functions, including air burst and delayed options. Although unit costs were somewhat uncertain as of 2006, the estimated cost for the INS/GPS version was around US$70,000. The cost of the second variant was more uncertain, but tentative estimates were $90,000 per unit or more. Boeing and the Italian firm Oto Melara have signed a contract covering the license production of 500 GBU-39s (INS/GPS) and 50 BRU-61/a racks for the Aeronautica Militare, at a cost of nearly US$34 million. Under a contract awarded in September 2006, Boeing is developing a version of the SDB I which replaces the steel casing with a lightweight composite casing and the warhead with a focused-blast explosive such as Dense Inert Metal Explosive (DIME). This should further reduce collateral damage when using the weapon for pin-point strikes in urban areas. On 28 February 2008, Boeing celebrated the delivery of the first 50 FLM weapons. The USAF intends to use the same FLM casing on a weapon of 227 kilograms (500 lb). October 2001 – Boeing is awarded the SDB contract. September 2005 – Small Diameter Bomb certified for operational test, evaluation. September 2006 – SDB team deliver the first SDBs to the USAF. October 2006 – Initial Operational Capability declared for SDB on the F15E. October 2006 – First use in combat. February 2008 – 1000th SDB I and first 50 FLM delivered. September 2008 – Israel receives approval from the US Congress to purchase 1,000 bombs. December 2008 – Reportedly used against Hamas facilities in the Gaza Strip, including underground rocket launchers. January 2009 – Unnamed Boeing official stated that they have yet to deliver any SDBs to Israel. August 2010 – U.S. Air Force selects Raytheon's GBU-53/B for Small Diameter Bomb II Program. ↑ "GAO-13-294SP DEFENSE ACQUISITIONS Assessments of Selected Weapon Programs". US Government Accountability Office. March 2013. pp. 101–2. http://www.gao.gov/assets/660/653379.pdf. Retrieved 26 May 2013. ↑ "USAF to award Boeing Laser SDB contract." ↑ "Small Diameter Bomb (SDB) - Defense Update". http://www.defense-update.com/products/s/sdb.htm. ↑ "Boeing Celebrates Small Diameter Bomb Delivery Milestones". http://www.boeing.com/ids/news/2008/q1/080228a_nr.html. ↑ 26.0 26.1 Katz, Yaakov (2008-12-29). "IAF uses new US-supplied smart bomb". Jerusalem Post. http://fr.jpost.com/servlet/Satellite?cid=1230456505080&pagename=JPost/JPArticle/ShowFull. Retrieved 2008-12-29. ↑ Butler, Amy (1/16/2009). "Mystery SDB". Ares Blog. Aviation Week. http://www.aviationweek.com/aw/blogs/defense/index.jsp?plckController=Blog&plckScript=blogScript&plckElementId=blogDest&plckBlogPage=BlogViewPost&plckPostId=Blog%3a27ec4a53-dcc8-42d0-bd3a-01329aef79a7Post%3a5095496d-eed1-4997-a61d-bb76a1a1dbaa. Retrieved 23 December 2011. Wikimedia Commons has media related to GBU-39 Small Diameter Bomb.